A couple of months ago I received an email from Eucerin, asking me if I’d like to try out their new range of skincare. Now, as I’ve said in previous posts, I’m a big fan of skincare so jumped at the chance to try something new! 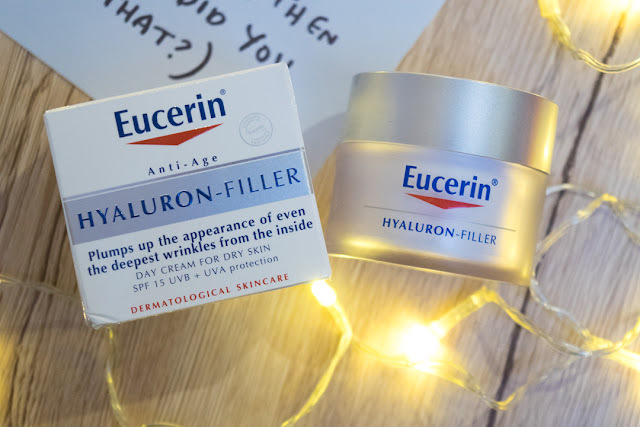 I’d heard of Eucerin before but had never got round to trying anything from their range, so I wasn’t really sure what to expect. But I must admit I was pleasantly surprised. 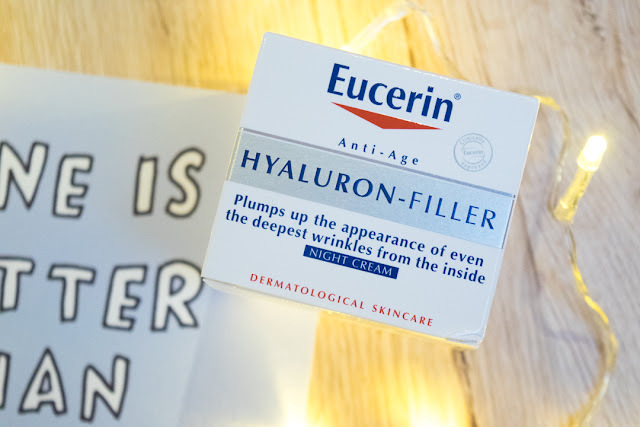 When a range of products from the Eucerin Hyaluron-Filler range arrived, I was really excited to get testing. I’d never really thought of using anti-ageing products before, as I don’t have problems with wrinkles or anything like that at the moment. But starting early and preventing problems before they appear is always a good idea! 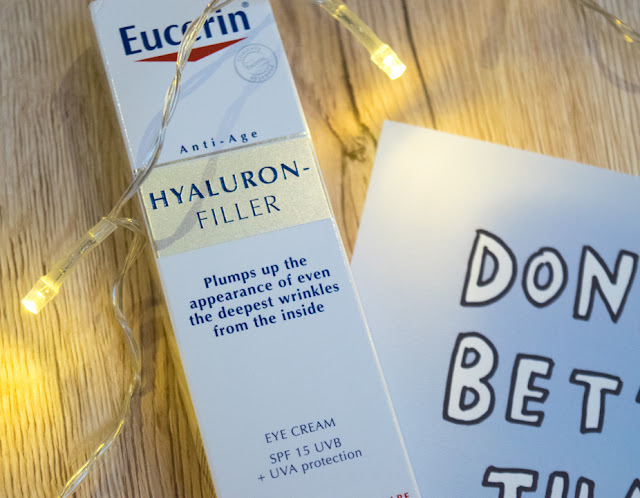 The first product I was sent to try was the Eucerin Hyaluron-Filler Eye Cream (£22). It has an advanced eye care formula specifically designed to target ‘crow’s feet’. Containing Hyaluronic Acid and SPF 15, the product works to help prevent the deepening of current wrinkles. 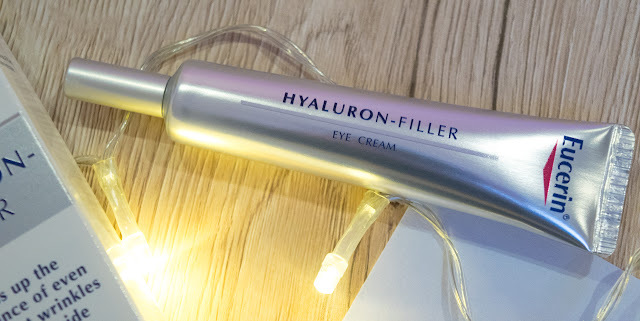 I’ve been getting really interested in eye creams recently, as the skin around my eyes is so delicate and I get terrible dark circles. This cream feels really cooling as you apply it and it sinks in so easily, without leaving a greasy build-up. I can’t comment on whether it has made a difference to any crow’s feet, as thankfully they’re not something I have a problem with at the moment. But it certainly feels nice to apply. 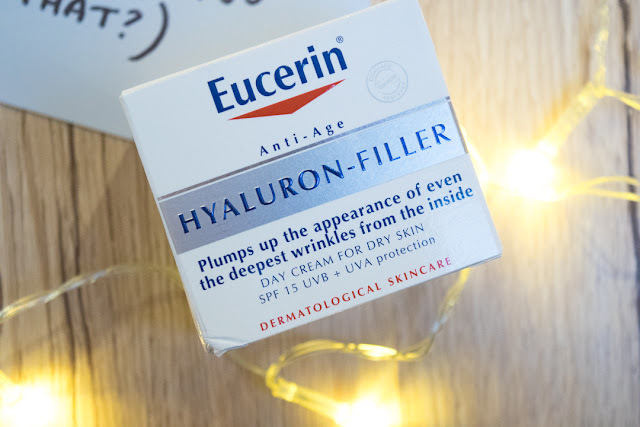 Next up is the Eucerin Hyaluron-Filler DayCream for Dry Skin (£26). It contains low and high molecular Hyaluronic Acid to instantly moisturise the skin and help plump up the appearance of even the deepest wrinkles. The luxuriously rich formula is targeted specifically for those with dry skin. As the weather gets colder and winter sets in, my skin starts to get very unhappy. So this is the perfect time for me to start using this product. It’s gorgeously rich and thick, yet it disappears into my skin so quickly, leaving it feeling smooth and supple. As with all the products I’ve tried, it has a very fresh, clean scent, which I really love. 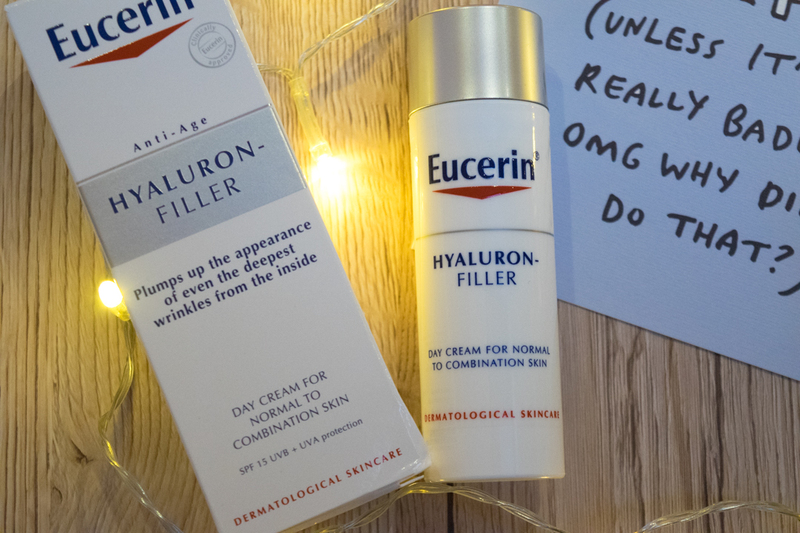 If you have more normal to combination skin, there is also the Eucerin Hyaluron-Filler Day Cream (£26). This is a light day cream that instantly moisturises the skin, helping to plump up the appearance of even the deepest wrinkles. It creates an excellent make-up base whilst also helping skin look visibly smoother. This is a really lovely day cream suitable for every day use. I love the fact it comes in a pump bottle, making it really easy to dispense with no wastage. My skin feels smooth and plump after using it, and it’s definitely something I would repurchase once I’ve used this bottle up. The last product from this range that I was sent to try is the Eucerin Hyaluron-Filler Night Cream (£26). This is an anti-wrinkle night cream with Hyaluronic Acid for all skin types. The advanced formula helps support the skin’s own overnight regeneration process whilst leaving skin feeling soft and hydrated after a good night’s rest. It’s the perfect cream for this time of year, and it really feels like it’s hydrating my skin overnight, leaving me with smooth skin when I wake up. The formula is thick and creamy, with the gentle clean fragrance, and soaks in almost instantly. If I have any extra left over, I also find it really nice to just rub into my hands. Alongside these products there are also a couple more in the range. First is the Eucerin Hyaluron-Filler Concentrate (£31); an advanced concentrated serum, which actively reduces the appearance of wrinkles. This is the range’s cult product and is designed to be used in combination with your daily skincare routine. It helps skin to feel smoother and more youthful, whilst also creating a flawless base for make-up. There is also the Eucerin Hyaluron-Filler CC Cream Light (£28), which is the range’s newest hero product. Not only does it act as an anti-wrinkle day cream, but it also complements and perfects the complexion for a healthy looking glow. The lightweight and fast-absorbing formula provides light coverage, whilst evening out skin imperfections for a smoother, more radiant complexion. 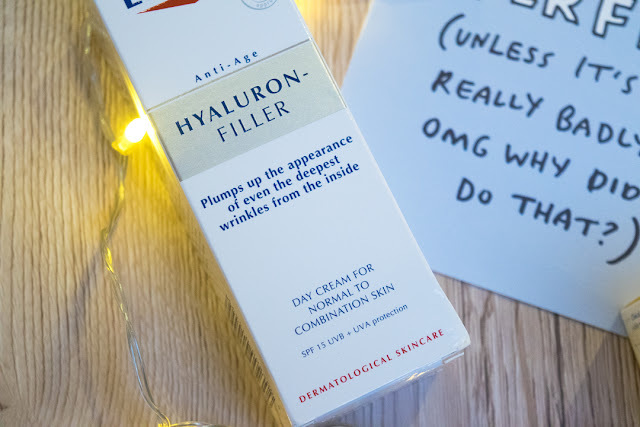 This product particularly appeals to me, as I often find with being ill that I don’t have the energy to do a whole skincare and make-up routine. So to have a product that does multiple jobs is always a winner in my eyes! 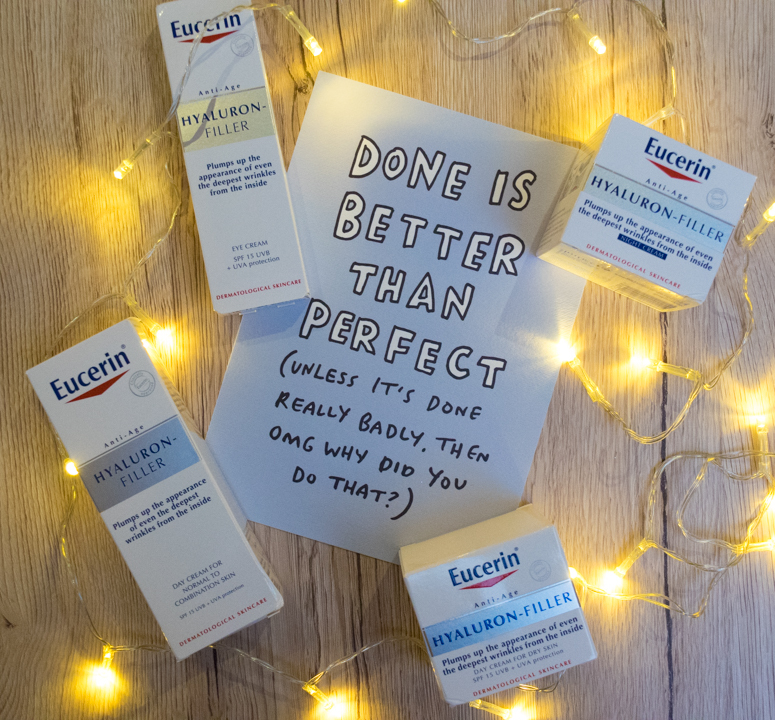 Have you tried any Eucerin products before? What do you think about the ones in this post? Or are there any other products/brands you would recommend?